With unicorn and flamingo pool inflatables trending at John Lewis, and the 2018 British summer veering on the side of reliable - it can only mean one thing… it’s time to get a pool. Luxury home swimming pools is a trend which is certainly taking hold within new city developments, as developers who are keen to capitalise on the foreign investment market within London are utilising high concept pools to pull in the crowds. 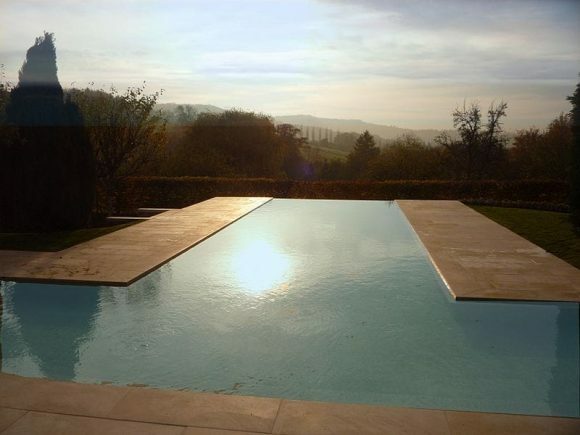 Indeed infinity swimming pools, glass box pools, suspended ceiling pools, swimming ponds/natural pools and retractable floors feature among some of the more avant-garde pool designs in the UK this year. Not everyone wants avant-garde from their pool however, some just want the guarantee of being able to use a pool year-round whatever the weather. 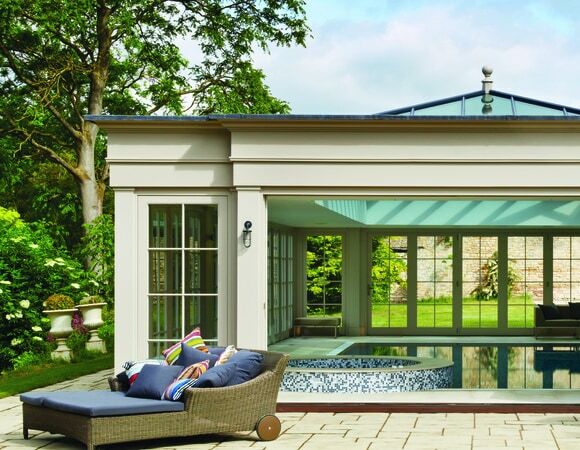 And for this reason, the pool house concept is consistently seen as the real must-have addition in UK real estate. Indeed, UK pool owners want the best of both worlds; they want the full stimulation to the senses that an outdoor swimming pool affords, combined with the comfort and reliability of an enclosed space. 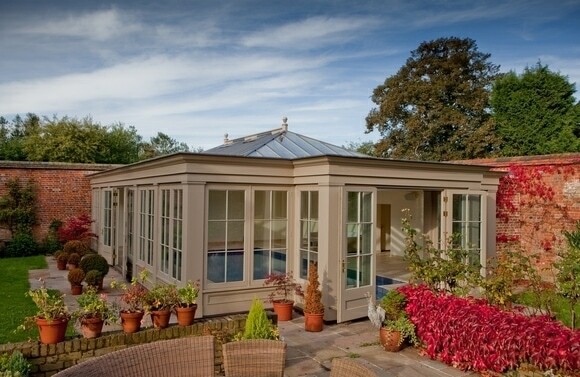 The solution to this conundrum is quite simply pool houses that are designed in a garden room extension/orangery style. Garden room extension/orangery style pool houses maximise the use of glazing on both walls and ceilings through the use of floor-to-ceiling windows, glazed gables and roof lanterns which give swimmers the blue-sky views they are craving, while the use of stacking or oversized French doors also create an uninterrupted connection with the outside, that allows the light to flood in and illuminate the water. The use of solar-reflective glazing also ensures that the surrounding views of the garden are free from the sun’s glare. ⦁ Access – One of the major trends we are seeing among our clients is the location of their pool houses as an extension of the main house, typically with French doors adjoining the two buildings. ⦁ Entertainment – Pool spaces are now seen as an entertaining space and so the inclusion of other leisure and entertaining facilities such as gyms, wellbeing areas and outdoor kitchens is growing in popularity among our clients. 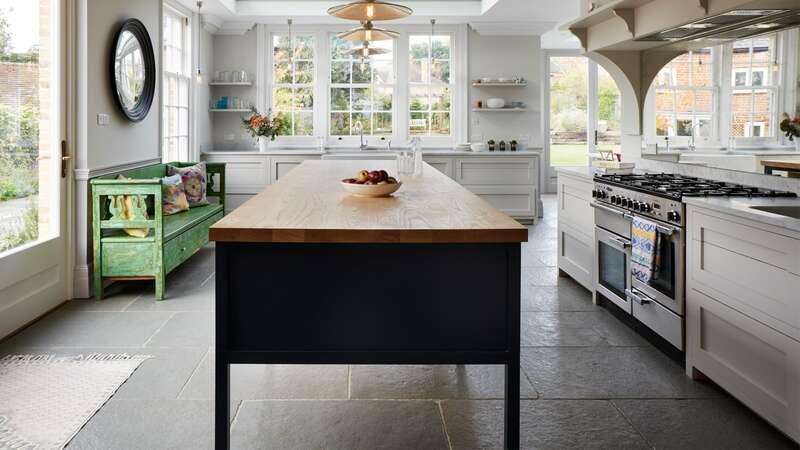 ⦁ Flooring – Natural stone is a popular finish in many of our pool houses, which fulfils the need for a hardwearing and waterproof material. Stone that is brush hammered or finished so that it is non-slip is also important. Typically, we advise clients to opt for a light shade of stone in order to reflect light back into the room to maximise light reflection. Using the same stone for any adjoining outside patio areas will help to maintain the flow between the indoor and outside spaces. ⦁ Lighting – Pool houses are typically big rooms and so the use of varied lighting will help to give the space character and charm. Lighting will also make a room that looks great in the day, look absolutely fabulous at night. ⦁ There are two types of lighting: task lighting and ambient lighting, both of which must be used in conjunction with one another. Low glare downlights bring soft accents for relaxation, while the simultaneous use of up and down wall light fixtures will cast ample light to the surroundings. Bolder lighting can be used to highlight feature points, illuminate a facade and to create mood and drama, which is ideal for entertaining and impressing guests. Ground lights in the garden will create focal points that add interest and dimension to what can otherwise a black wall of night. For those who are really invested in creating a cohesive design scheme, dimmable underwater lights with LED fittings that can change colour can also help to harmonise the pool with the building and its surrounding landscape. ⦁ Plants – Again, pool houses are big spaces that need to be softened by design and decoration. We often see the use of planting schemes in and around the pool house to soften some of those hard edges and to further enhance the interrelation between the spaces. This sort of design is perfect for the orangery/garden room extension which lends itself so well to balancing difference spaces and areas. Although many designers cite humidity as one of the biggest challenges they face when designing a pool and its surrounding area, this doesn’t have to be an issue with the right amount of pre-planning and design understanding. 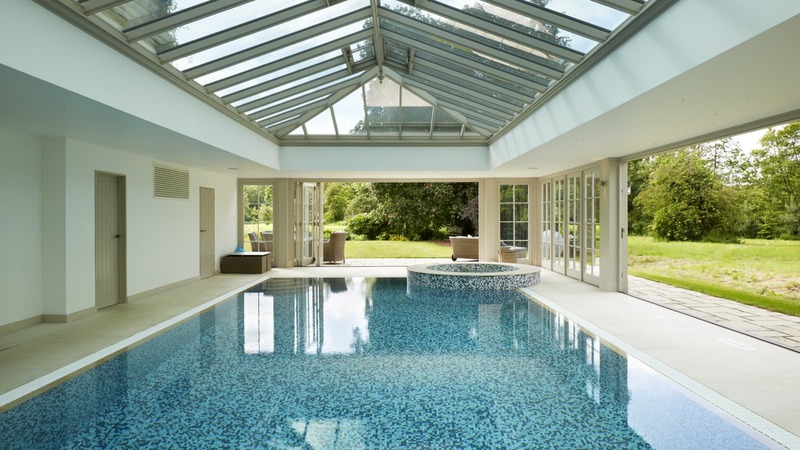 Pool houses require heating and ventilation systems that will ensure sufficient airflow and climate control in order to prolong the durability of the space and to prevent mould and decay. 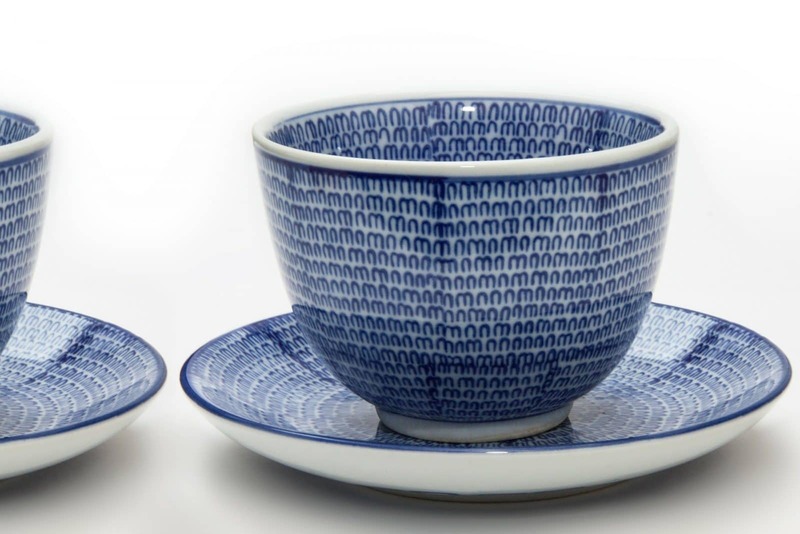 Understanding that subtle changes can make a world of difference is also key. For example, a semi-glazed (as opposed to fully glazed) roof will help to maintain a controlled and more economical climate. Elements such as insulation also need to be calculated to minimise cold spots and condensation. The chemicals that are used in and around pools are also a source of problems for some pool owners, with the long-term exposure to such treatments often causing structural damage. However, such issues can be avoided entirely by taking this into consideration at the design and build stage of a pool house project, and utilising the right materials, from specialist paints to dedicated glues, that are designed specifically to work in this kind of environment. While eccentric and unusual pools will come and go, the classic garden room extension/orangery style pool house affords users the opportunity to create a classic and beautiful building which sits harmoniously within a garden setting, all-the-while providing the option of heating and insulation to ensure that users and their guests can go for a swim, whatever the weather, day or night. And by choosing a classically designed concept that is built from the right materials, you are guaranteed a building that won’t deteriorate, won’t date and will last indefinitely. 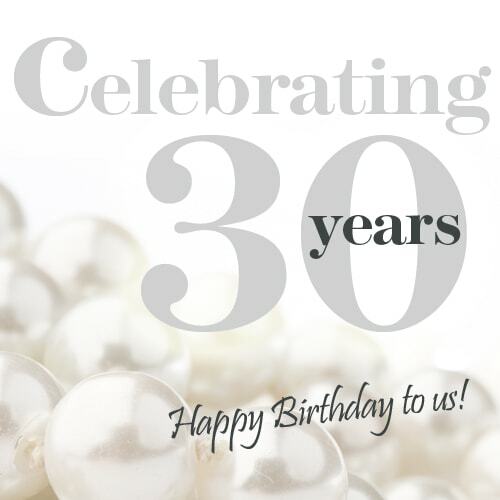 May 2018 is a special date here at Westbury because it marks our 30th anniversary!